On July 28 1862 the Mail car was introduced making it possible to sort the mail on the train. On July 27 1861, General McLellan was named commander of the Army the Potomac after the the defeat at 1st Manassas. 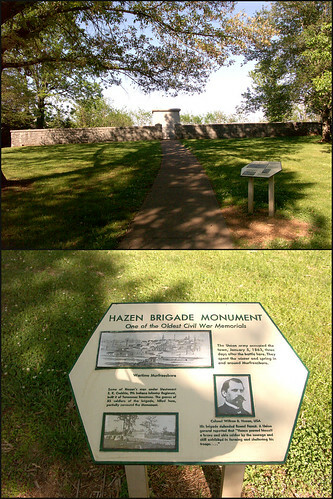 The Oldest monument in the country was built on July 27 1863 was built at Stones River to commorate the actions of the Hazen Brigade at the Battle of Stones River. It is the oldest intact monument. Sorry that I didn’t get Saturday’s post up. On July 25 1861, Congress passed Crittenden-Johnson Resolution which said that the Union was not fighting to end the ” Peculier Institution” but rather to preserve the Union. On July 24 1866, the first state to be readmittedinto the Union was Tennessee. Tennessee seceded in May 1861, it was in the Confederacy for five years. The War had only been going on for four months when the battle of Manassas was fought. It was know as Manassas by the Southern soldiers and Bull Run by the Northern soldiers. It was named this because the Northern soldiers were impressed by the natural things that they didn’t see all that often in the industrialized North, and for the South it was named this because of the towns they had known for so long. The Generals in command of the two armies were General Beauregard commander of the Confederate Army and General Irvin McDowell in command of the Union. The other famous people were the statesmen, Congressmen,and leisure seekers who would in a later part of the battle in the way. Another more famous or later to be famous figure present at this battle was General William Tecumseh Sherman. The troops under General Irving McDowell were stationed in Washington D.C. The Troops under General Beauregard were stationed at Manassas Junction which is south of Centerville Virginia. The Union Army began to move its great juggernaut of an army on July 16 a861 from Washington towards Manassas crossing Bull Run at Sudleys Ford. General McDowell wanted to go around the left flank of the Confederates and make a surprise attack on Matthew’s Hill near Sudleys Ford. Since both armies were relatively unseasoned or green as sometimes called by the soldiers in the army this was impossible also the Union (or Confederate troops for that matter) were not very well trained so it proved disadvantages for the Union Army to do this. Rather then be a suprise attack the Confederates saw it coming and were prepared. The f ighting on Matthew’s Hill raged through the day and the Confederates were driven back to Henry Hill. A brigade under Thomas Jackson arrived on the field from the Shenendoah Valley to strengthen the Confederate line. While some of the Confederate line was breaking and running General Jackson and his troops stood their ground and held the position. While General Bartow’s (CSA) troops were retreating he yelled to them ” Look there stands Jackson like a stonewall let us determine to die here to day and we will conqure.” Shortly after saying this General Bee was shot through the heart. This statement made by General Bee is where General Jackson recieved his ever iconic nickname Stonewall. It was after this incident that “stonewal” Jackson ordered his men to charge saying ” When you charge yell like furries!” This charge along with the efforts of the other brigade commanders broke the Union line sending them into a wild retreat. The spectators that I mentioned before now became a problem. All of the people in their fine clothes and carriges rode out to see the battle thinking it would be a grand site to see the Union Army sweep the rag-tag army of rebels off the field, but when the Union troops were the ones running they began to panic and run just like the soldiers, right back to Washington. Thus causing a gigantic traffic jam. Men got trampled by the wagons and carriges of the army and of the onlookers. The wounded who could not walk had to be transported in wagons and those wagons also got stuck in the melee’ . To make things worse the Confederates were sending what was sometimes playfully called their calling cards ( shells) to the retreating troops. For this was all the Confederates could do due to the fact that they were very diorganized by victory. Men were running and chasing the Yankees others were staying in their positions. “We were more disorginized by victory then by defeat.” said General Beauregard. The cost in casualties for the North was 460 killed, 1124 wounded, and 1312 captured, the casualties for the South were 387 killed, 1582 wounded, and 13 missing. The Union Army straggled into Washington D.C amid a rainstorm on July 22 thus ending the first major battle in the Civil War with the first of many victories for the South. The memory of that battle has gone on even after those who actually saw it died may that memory live on forever. On July 23 1862 General Henry Wager Halleck was appointed commander of all theUnion Armies. On July 23 1862, the largest movement of troops by the Confederate Army was made when General Braxton Bragg moved his men 770 miles from Tupelo Mississipi to Chattanooga Tennessee. On July 20 1864, John Bell Hood (CSA) having been just recently appointed the new commader of the department of the Tennessee led his troops, against General William Tecumseh Sherman (USA) in the battle of Peachtree Creek, which turned out to be a horrible loss for General Hood. Peachtree Creek was Hood’sfirst battle as commander of the department of the Tennessee. On July 19 1861 a commitee of prominent Unionist Virginians met in Wheeling Virginia to establish their own government they also elected a governer for their new government Frances H. Pierpont was the new elected govener. West Virginia would go on to become a state in 1863. It was the only state to be admitted to the Union during the Civil War.